talented teenager is spotted playing football in Southall, a world of unexpected opportunities opens up before her. But as her sister’s traditional Indian wedding approaches, can she keep her family happy and still follow her dreams? 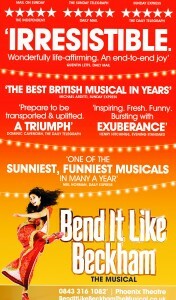 Bend It Like Beckham is a joyous British musical comedy. Featuring an original score with an Indian kick, it brings a unique cultural fusion of musical theatre to the stage for the first time. This reimagining of the much-loved hit film sees generations, cultures and communities brought together in this joyous and uplifting story about bending the rules and scoring that deciding goal. "Initially I resisted the suggestion to give Bend It Like Beckham a musical treatment, but as time went on I realised how significant I thought the film had been in terms of race relations in this country, the presence of the Asian community and how very little came after it that celebrated who we are as a nation in the same way. I had been deeply moved by Billy Elliot the Musical and loved how it had crystallised a particular moment in history, so I began to reconsider. Developing Bend it Like Beckham for the stage, has been the most enjoyable creative process of my career so far. What I have been very lucky to do, is to surround myself with people who I think are exceptional, at not only being at the top of their game, but who completely understand what we are trying to do. What you will see in Bend It Like Beckham is the result of 4 years’ worth of collaboration: multiple workshops with musicians, actors, dancers and of course footballers. re we are as a nation. The Asian influences that are there are basically Punjabi West London – those that I have grown up with – fused with West End musical influences. What we tried to do is make a stakehold for those of us who believe we live in a brilliant nation that is all the better for being as diverse and as interesting culturally as it is, and that it isn’t just one community that has created this." "Look At Us Now/Get Me"
"People Like Us (Reprise)/Glorious (Reprise)"
"Fly (Reprise)/Girl Perfect (Reprise)/Bend it (Reprise)"